At the Moulsari campus, environmental issue have always been central to our concerns; our distinction lies in the fact that most of these initiatives have been proposed and then carried out by the students themselves, with the wholehearted support of all here. To create a sense of association amongst the school to the environment. To create awareness about the environment and various intermittent issues. To integrate the ideals of conservation, preservation and sustainability. To formulate plans and programmes to further the environmental activities of the school. We pioneered vermi-composting at our campus where the waste from the kitchen and canteen was collected in a pit to decompose and turn into a nutrient-rich humus, very valuable organic manure, by worms and micro-organisms. This humus was then used to fertilise the gardens and fields. The school has a paper-recycling plant where the waste paper collected from the schools is recycled to produce paper that is then used for various purposes within the school itself. Tetra-packs are being recycled to raise funds for various social service organizations. The students have carried out surveys to test the quality of the air and water in and around Gurgaon to check their suitability for human consumption. All such efforts have been established on a firm footing with the induction of a Head of Environment Initiatives into the Student Council and the setting up of a Paryavaran Club. The first Head initiated a project to save the tonga in the summer of 2010 when the MCD, in anticipation of the Commonwealth Games decided to rid the streets of Delhi of the tongas. The students worked to rehabilitate not only the horses, but their owners, and incorporated the tonga in the INTACH Heritage Walks scheme, by including tonga-exclusive trails around monuments like the Red Fort. This programme is an initiative of the SRF foundation with Shri Ram School, Moulsari. It focuses on educating the students of Mewat from classes 6, 7 and 8 in a way that is both interactive and distinct for everyone involved in the programme. Mewat is a district in Haryana, less than a couple of hours’ drive away from our school. Our students from Class 11 visit Mewat in batches every Friday and teach the children a variety of topics; ranging from subjects like science, social studies and English, to general yet important issues like sanitation, waste management and pollution, to name a few. We also concentrate on the environment, its daily impact on the students’ lives and its effect on their general health and hygiene, thus improving the overall standard of cleanliness in the schools and the village. The school won the prestigious Pramerica Community Award for this initiative this year. Our school has actively participated in the campaign to save tigers by creating awareness about the alarming state of the tiger in the country at the moment, encouraging tiger conservation and saving tigers from extinction. They have also worked to rehabilitate Mogia tribe who have been displaced by the national park. Meet Kirat Singh And Keerthikrutha S.
As part of this programme, The school participated in the Torchbearer’s programme, which was initiated by The Energy and Resources Institute (TERI) in collaboration with various NGOs throughout the country. The main orientation of the programme was to bring about the use of renewable sources of energy in Indian villages. For this purpose, TERI began to introduce solar lights and lanterns in villages especially in those which are in critical regions in terms of wildlife. The entire aim of the project was to improve the social and economic life of these villagers. TSRS Moulsari focused on the desert-state of Rajasthan in the Sawai Madhepur District near the Ranthambore National Park, a tiger haven. Our project was to help install solar lanterns would provide them relief from the kerosene-diesel ‘chimneys’ (as they were called); and all the villagers agreed to it, including the appointment of an entrepreneur who would manage the conduct of the charging station and solar lanterns which would be placed in his house. The trip initiated a huge response from our school. Through various campaigns and fundraisers we generated more than rupees one lakh in a hope earn more money so that more lanterns could be purchased. Students from class ten made cloth bags and sold them so that the income derived could be utilized in purchasing solar lanterns for the forest guards in the National Park. The aim was to introduce solar electrification in the security posts ‘chowkies’ of the park, so that the guards would have a ready source of energy throughout the night which would help them in their operations. The snow leopard (Panthera uncia) is a large cat of the high mountain ranges of central and southern Asia. It is listed as “endangered” on the IUCN Red Data Book and is listed in Appendix I of the CITES. The Snow leopard is the least studied big cat in India. 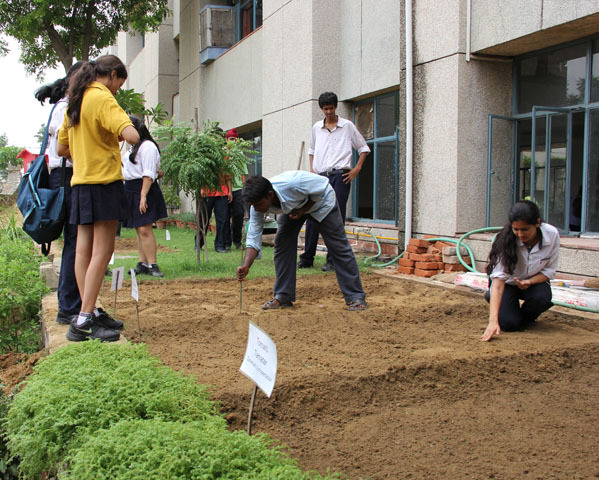 The students of the Environmental Initiatives programme have been dedicated to raising funds through various bake sales, old newspaper sales and creative stalls. When Diwali is just around the corner the Paryavaran club initiates a campaign against crackers to inform children about the various reasons why crackers should not be bought and used. They were told about the children who make these crackers in deplorable conditions, suffering from various illnesses due to the chemicals used in the crackers and the immense amount of pollution that these crackers cause. They spread awareness about one of the causes of global warming, that is, the burning of crackers. Many promised not to light crackers. This initiative included the use of smokeless diyas. Before Holi, one of the most awaited festivals, the children are made aware about the fact that Holi has its positive and negative aspects, the positive being the interaction with friends and family with complete enjoyment, and the negative being the wastage of water leading to acute shortages, and the use of harmful chemical colours, better known as permanent colours. 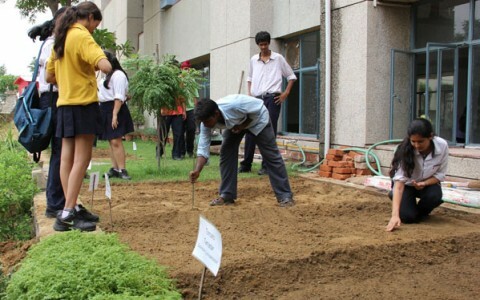 Students are encouraged to find ways of utilizing this water and to use organic colours instead. The Class 9 members of the Paryavaran Club visited Gyan Shakti Vidyalya to give the children solar lanterns. Money for the solar lanterns was collected on activity day when each child paid Rs.10 for each day that they wore coloured clothes. They have also started a new project, which is Tetra Pack Recycling. Class 9 students put up an assembly to introduce the project to the school. They spoke about the 7 layers present in each tetra pack and how each and every one of it can be recycled and can be reused. A student of the 7th grade designed a poster for the tetra pack recycling project which were then laminated and posted near each of the dustbins for tetra pack collection. Special occasions are celebrated and marked by the planting of trees.